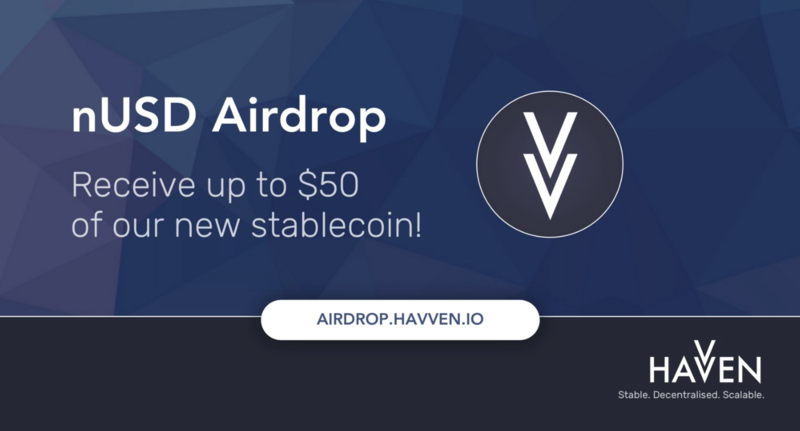 Havven, a decentralized payment network and stablecoin, has officially launched an airdrop of nUSD tokens, its stablecoin, for selected holders of havvens, its collateral token. The airdrop, which launched June 16, offers all members of the public a chance to secure nUSD tokens. nUSD is a decentralised and scalable stablecoin on the Ethereum network that is designed to keep a stable value of USD$1. It was launched on June 11, and marks the full release of the Havven payment network, which rewards people who lock havven tokens and issue nUSD. This is a major milestone not only for Havven but the entire blockchain ecosystem, as nUSD offers a decentralised and scalable solution to a significant problem in the cryptosphere: price volatility. The company’s first airdrop campaign, completed in February, received tremendous support as over 150,000 participants entered to receive a free portion of 2 million havvens. This second airdrop, open to 50,000 participants who hold at least 25 havvens, is designed to provide public access to a stablecoin that is compatible across the entire Ethereum network.